Monitoring frost in Corozal Crater. 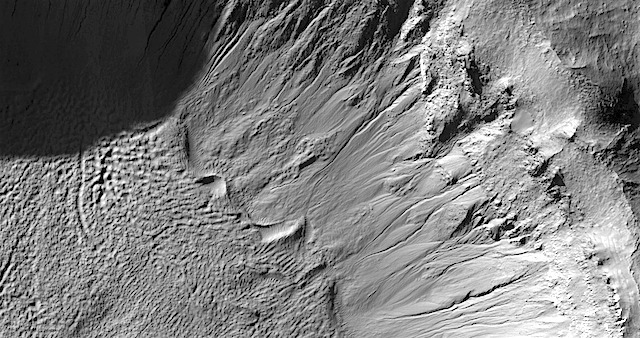 Corozal Crater has both active gullies and recurring slope lineae. We are monitoring the evolution of seasonal frost, which is the likely trigger for gully activity. Never mind the hulking shadow at the left. This entry was posted in Reports and tagged Beautiful Mars, Corozal Crater, frost, gullies, High Resolution Imaging Science Experiment, HiRISE, Mars Reconnaissance Orbiter, MRO, NASA, recurring slope lineae, RSL, University of Arizona. Bookmark the permalink.